If you have any photos or memories of this school to share, contact us. MODERN ADDRESS Located west of Co. Rd. 21. The first school was held in a blacksmith shop belonging to Mr. Bolles, with Mrs. Palmer as teacher. The school was then held in a boarding house. Enrollment in 1898: 33 students. In 1938: 25 students. 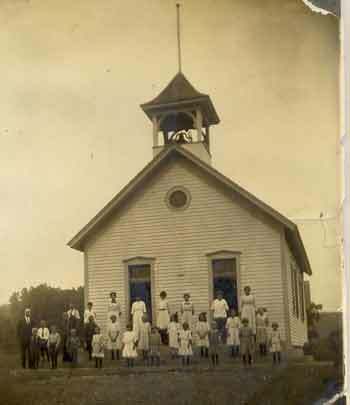 A new schoolhouse was built in 1885. Teachers: (before 1898): E.J. Emerson, Cassie Rice, Annie White, Hattie Allan, Sophia Tyler, Alice Berry, Lizzie Van Slyke, Emma Folson, May Black, W.E. Bush.